Patterns of land use on North Central’s private land reveal a significant level of agricultural activity. The flatter and more fertile areas within the catchment have been substantially cleared for dryland agriculture, principally sheep and beef cattle grazing (the former DNRE, 1997), while crops include grains - such as cereals, legumes, oil seed and hay. 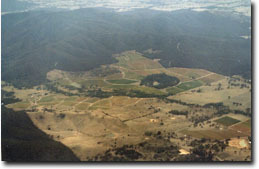 Forestry is also a significant land use, particularly around Creswick and Daylesford. Approximately 13% of the catchment region is public land and much of this has been nominated for specific purposes, such as State and Regional Parks, scientific/education areas and Flora Reserves. About 10% of these public lands are managed by the Department of Sustainability and Environment (DSE) through licence issuing. Landuse (including viticulture, grazing and native vegetation) in the Pyrenees region. This map provides an overview of land use across the North Central region and has been generalised from more detailed mapping completed as part of the North Central Land Use Mapping project. The procedure used to develop the North Central Land Use Map balanced the need for reliable data, practicality and cost effectiveness. The work was carried out by Department of Primary Industries staff at Tatura and supported by the Bureau of Rural Sciences (BRS) (external link). The former Department of Natural Resources and Environment (DNRE), (1997). Victoria’s Biodiversity: Directions In Management, Melbourne. North Central Catchment & Land Protection Board (NCCALPB), (1997). Regional Catchment Strategy. TBA Planners P/L. and Neil Clark & Associates (1998). North Central Catchment Profile: A profile of the community and economy of the North Central Catchment Management Region. Report compiled for the North Central Catchment Management Authority, Bendigo.